A. Miss Scarlet is the killer, and Wadsworth is an FBI agent. B. Mrs. Peacock is the killer, and Wadworth is an FBI agent. C. Professor Plum killed Mr. Boddy, Mrs. Peacock killed the cook, Colonel Mustard killed the motorist, Mrs. White killed Yvette, Miss Scarlet killed the cop, Wadsworth killed the Singing Telegram Girl. Mr. Green is an FBI agent, and kills Wadsworth. We also find out that Mr. Green is not really gay and, in fact, has a wife. D. [NEVER USED] Wadsworth poisons all six guests and is killed himself by a German Shepherd dog when he attempts escape from the mansion. This ending wasn't really meant to be funny, unlike the movie, and it's never been released. Doesn't sound too good, does it? Of all the endings, I like C the best. It's the most intricate and interesting, and it serves the movie best. I don't know why they bothered with all the alternate endings. They should have just used C. I think the alternate endings confused people, and made them think that watching the whole movie was for nothing. Plus, three different endings did nothing to solidify the plot; ANYTHING could have happened. I think having three different endings took away any legitimacy this film had as a murder mystery. I also think that is why it flopped in theaters. I love the movie, alternate endings and all, but it did very poorly at the box office...even with the gimmicks. Another mistake is that they released it on December 13, 1985. I think the Christmas-time part of the year is the suckiest time to release movies. Any movie that's released on or around a holiday like Thanksgiving or Christmas almost always flops due to poor attendance. I don't know why people still insist on releasing movies in theaters at those times. If this had a Summer release it would have done at least moderately well. Jane Wiedlin of the 1980s girl-pop group The Go-Gos had a small, but spotlighted part as the Singing Telegram Girl who gets killed as soon as she pops up onscreen. This movie is such an intricate mystery. 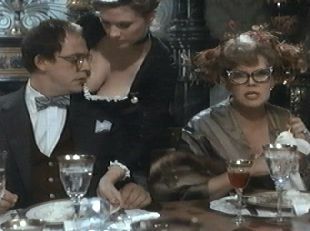 It also has a great, comedic ensemble cast, and the mansion itself is a great set with its trap doors, hidden rooms, etc. This film is as entertaining as any Charlie Chan or Sherlock Holmes film. Special mention must go out to my favorite star of the film, Colleen Camp. She played the silly, chesty French maid Yvette who ends up getting killed late in the film. I've enjoyed Colleen in all the projects I've seen her in, but this is probably her best character.